Historic Bridge in Washington State Available/ Catch: State Will Pay for the Costs. Any Takers? Photo taken by K.A. Erickson in 2009 before it was replaced. 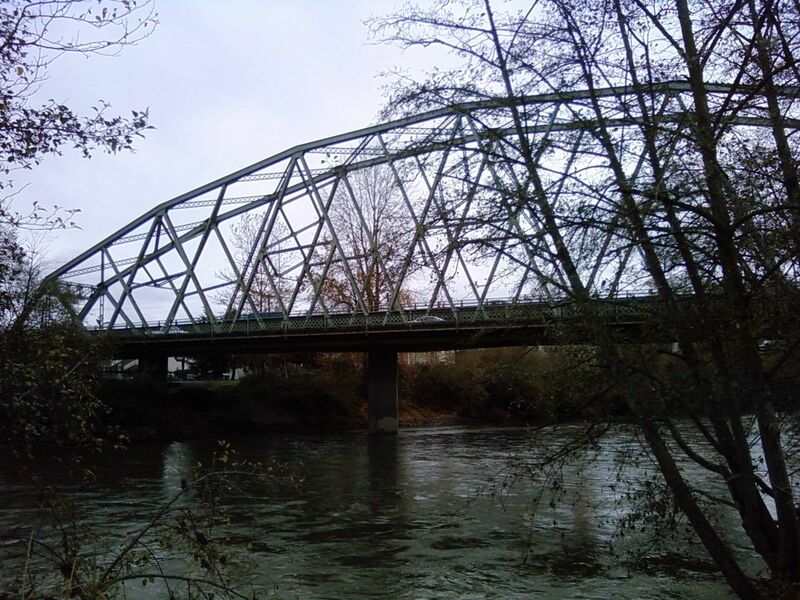 Washington DOT (WSDOT) will pay up to $1 million for the dismantling, transporting and reassembling of the 1925 through truss bridge to be reused for any purpose. TACOMA, WS- Sometimes historic bridges get into the way of progress and need to be replaced. This is especially true with bridges whose height, width and weight restrictions hamper the ability to get trucks and other means of transportation across. However, before they are removed, states are required to put them up for sale so that third parties can claim them and relocate them the way they see fit. In general, the bridge program has had a mix of successes and failures in selling off their historic assets, for on the one hand, third parties wishing to purchase the historic bridge for use are shirked away by the cost for transportation and reassembly. Furthermore bridges marketed by the department of transportation are often too big or in the case of arch, beam and suspension bridges, too entrenched or too fragile to relocate. On the other hand, however, one will see in each state a success story of a historic bridge that was given to a third party. This is especially true with truss bridges as they are easily taken apart, transported to a new location in segments and reassembled. One will see an example in every state, yet Indiana, Texas, Iowa, Ohio and Minnesota have multiple examples of success stories. Even some stone arch bridges have been relocated to new sites where they still serve their purpose. According to the information by the WSDOT and bridgehunter.com, this historic bridge was built in 1925 and used to cross the Puyallup River at State Highway 167 (Meridan Street) in Puyallup, located seven miles east of Tacoma, until it was replaced in 2011 by a modern crossing. It was then relocated on land, where it has been waiting for its new owner ever since. Washington has got a wide array of historic bridges, whose unique design makes it appealing for tourists. They have the Tacoma Narrows Bridge (with its name Galloping Gertie), the , the world’s only concrete pony truss bridge, and a housed through truss bridge made of wood in Whitman County that was once a railroad crossing, just to name a few. The Puyallup Bridge is a riveted Turner through truss bridge, a hybrid Warren truss design that features subdivided chords and A-framed panels. After the demolition of the Liberty Memorial Bridge in Bismarck, ND in 2009, this bridge is the last of its kind and one of two of its design left in the world- the other is a Turner pony truss crossing in the German city of Chemnitz. Normally, going by the standard marketing policy, the historic bridge is marketed first before it is replaced and then taken down if no one wants it. However, looking at that tactic done by many state DOTs, this has not allowed much time for third parties to step forward and save it, especially because of the costs involved. For some bridges, like the Champ-Clark Truss Bridge, spanning the Mississippi River at the Missouri-Illinois border, there was almost no information about the bridge being up for sale as well as a very small time window of three months, thus providing no interest for at least one of the spans. According to MoDOT representatives in an interview with the Chronicles a couple months ago, the spans now belong to the same contractor building the replacement, who in turn will remove the spans when the new bridge opens in 2019. The Pullayup Bridge is different because of its large size and rare design, which goes along with the history of its construction. It was built in 1925 by Maury Morton Caldwell, a bridge engineer who had established his mark for the Seattle-Tacoma area. This event was important for its completion came at the heels of the introduction of the US Highway System a year later. Born in Waynesboro, Virginia in 1875, Caldwell moved to the Seattle area in 1904. He worked as a civil engineer for the City of Tacoma from 1910 to 1916 before starting his own engineering business. Prior to the construction of this bridge in 1925, Caldwell had been responsible for the construction of the Carbon River Bridge in 1921, the Pasco-Kennewick Bridge in 1922 and the Wiskah River Drawbridge in Aberdeen in 1925. Yet the 371-foot long Pullayup Bridge proved to be one of his masterpieces that he built in 1925, thus leaving an important mark on his legacy of bridge building in the Seattle-Tacoma metropolitan area. It is unknown how many other bridges were credited to his name, but from the historic research conducted by WSDOT, he was never a licensed professional engineer for Washington State and only practiced the profession for the Seattle-Tacoma area, which means the highly likelihood of more bridges having been designed by Caldwell and located strictly in north and western Washington and possibly British Columbia. He died in 1942, having been survived by his wife, Amy, whom he married in 1915, and his sister Nettle, who resided in Virginia state. The Pullayup Bridge is being offered to those interested by WSDOT between now and 2019. The catch to this is the DOT will pay for the dismantling, relocation and reassembling costs- up to $1 million for the whole process. The only cost that the party may have to pay is for the abutments and possibly the road approaching it. The deal provided by WSDOT is a great steal for those wishing to have a unique historic bridge for reuse as a park or bike trail crossing. Even the thought of using it as a monument describing the history of the bridge, bridge engineering and M.M. Caldwell is realistic. Some parties who have called up wished to convert it into a house, similar to one of the reused spans of the now demolished eastern half of the San Fransisco-Oakland Bay Bridge, which had been built in 1936 and was replaced with a cable-stayed span in 2013. The main slogan is if you have an idea for the bridge, WSDOT can pay for it, and you can make your dream a reality. With many successful projects, stemming from creating historic bridge parks in Iowa, Michigan and coming soon to Delaware (where historic bridges were imported from other regions) to numerous bridges along the bike trails throughout the US, Europe and elsewhere, this deal to have the bridge for free, with a transportation agency having to pay for the relocation and reerection at its new home, is something that one cannot really afford to miss out on. If you are interested in this unique historic bridge, please contact Steve Fuchs at WSDOT, using this link, which will also provide you with more information on this structure. The agency is also looking for more information on M.M. Caldwell and other bridges that he may have designed and contributed to construction. If you know of other bridges built by this local engineer, please contact Craig Holstine, using the following contact details: holstic@wsdot.wa.gov or by phone: 360-570-6639.